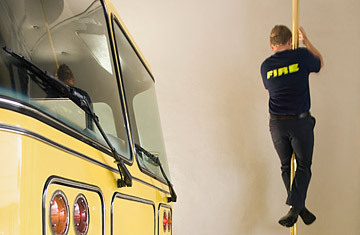 Firefighter sliding down a fire pole. If it's been a few years since your last school field trip to the local fire station, brace yourself for disappointment  because you'll be hard-pressed to find the signature apparatus you remember: the fire pole. As safety officials and architects design new facilities, liability issues are relegating poles to the dustbins of history. Now stairs  and occasionally slides  are replacing those fire-hall icons of yesteryear. While some new stations in the U.S. still include poles, the National Fire Protection Association aims to change that. "Fire departments are questioning the need for a fire pole and going with regular stairs," says Ken Willette, a retired fire chief in Massachusetts who now manages the association's public fire-protection division. "If there was a fire pole, we would want it enclosed so nobody stumbles into it in the middle of the night." Seattle knows this danger all too well, having settled a lawsuit for $13 million in 2009 after a firefighter fell down the open area around the pole and sustained brain injuries. The city has gone on to ban the poles as it renovates or replaces all 32 of its neighborhood fire stations. "The pole is something we associated with as kids," says Scott Wolf, a partner at the architectural firm Miller Hull, which designed Seattle's Lake City station that opened in June and another station set to open in the Greenwood neighborhood in 2011. "But the pole has been one of the biggest sources of firefighter injury." Instead of poles, modern designs focus on single-story stations or on placing staircases in various locations to improve firefighters' speed. In North Carolina, Wilson Fire/Rescue Services has come up with a different solution: slides. Commander Ben Smith calls them "a little bit safer" than poles. No matter the conduit, getting firefighters to the equipment as quickly and directly as possible remains critical. Susi Rosenthal, an assistant fire chief in Seattle who oversees the city's facilities, says poles have always been a personal decision anyway. "I always prefer stairs," the 30-year veteran says. "As long as you get there at the same time, it doesn't matter. In my experience, the younger you are, the more likely you are to slide a pole." Wolf says he set out to turn Seattle's bunker-like facilities into intentionally extroverted civic locations so that citizens "understand what happens in fire stations," he says. Apparatus bays at the Greenwood station come right up to the property line, allowing passersby to look inside. This move also lets in more daylight, which has helped the station and others stay on track to attain LEED Gold certification, a relatively new accomplishment for these specialized facilities. Aside from more daylighting, the new fire stations in Seattle incorporate sustainable features like responsibly harvested wood, durable materials and energy-efficient equipment, and even the water is getting greener. At the Lake City station, a 7,000-gallon underground storage tank collects rainwater  plenty of that in Seattle  that is used for flushing the toilets, watering the landscape and washing the fire trucks. Sorry, kids, a gray-water system may not be quite as cool as a fire pole, but at least the trucks will still be bright and shiny.